In my mother’s home, the house I grew up in, there’s a cupboard. It’s the same cupboard you have in your own family home, even though it’s a different shape and size. Perhaps yours is even an attic or basement, but fundamentally it’s still the same place. The cupboard is surprisingly deep, and the small, bare bulb works only intermittently. I have a theory that when you flip the switch (just inside the door), the bulb stays off only if you’ve forgotten that deep cupboards are places to quite rightly be just a little bit afraid of. If you’ve forgotten that fact, perhaps because you’ve grown up and society has long since shamed you into dismissing your irrational childhood fears, then the cupboard reminds you. I’m oh so dark without that little light on, it says; don’t you remember? The cupboard has the smell of all such cupboards: dryness and age. The dusty, papery aroma of old stuff, and of a space that exists physically within a home, but not quite in the same time. You know, logically, that once upon a time it was bare, and that at some point it smelled new. Safe smells, like paint, or wood, or freshly-laid carpet. The cupboard was like that once; of course it was. Probably even several times, after each new owner moved into the house. But your intuition says something different, particularly when the bulb decides to remain dark. Your intuition says that the cupboard has always smelled this way, always smelled the way that hidden places do, and that it was old on the day the house was completed. Perhaps even before. You realise this, and then maybe you go and get a flashlight before continuing to explore. Perhaps you walk away just a little too quickly, and return only reluctantly. In my cupboard, the first thing you push past is the long-serving artificial Christmas tree, stacked near the door for easy access, and you think of Narnia every time. Pine needles (plastic though they may be) and the low, metallic smell of discarded tinsel that, in here at least, could double for the scent of winter. Peter and Susan and Edmund and Lucy. The next thing you find is the suitcases, some of them almost museum pieces. Never used anymore (the actual travelling luggage sits atop assorted wardrobes in bedrooms, or pushed far under beds and surrounded by shoes), but for some reason still kept. It helps to lift some of the suitcases out of the way, to make room. They all have something inside them; something small and light, that moves when you tilt the case to lift it out past you. I’ve never opened any of them, so I’m not sure what those things are. I’d probably be disappointed if I ever did look, but perhaps I’d be amazed. I can live with the mystery. In fact, I prefer to. Answering those questions involves risk, and not always just of disappointment. As you continue, your foot fetches up against a step. Ridiculously, there are steps in the cupboard, at the back. They continue up almost above the height of the door behind you, making the cupboard climb even as it worms its way into the core of the house. You try to imagine the topography of this space, within the context of the inhabited rooms you know. Perhaps it doesn’t quite fit, no matter how you twist the mental model. You glance back over your shoulder, and the doorway is still there. That’s the important thing. Right now, that seems like just about the most important thing in the world. At last, up the stairs at the back of the cupboard, right about where Narnia should be, there are the boxes. Big old cardboard boxes emblazoned with brands that no longer exist, that once contained products which have long since been thrown away. The boxes contain those few artefacts of childhood that were deemed fit for preservation in this cryogenic facility (it is a bit chilly in here, you notice, but you’re sweating nonetheless). Most of the toys are gone, of course - given away to siblings, cousins, neighbours or charity. Some just thrown away; current whereabouts unknown. In the boxes marked “Matthew”, there’s some of the same stuff that’s in your own cupboard. Some comicbooks, some cherished action figures, even a beloved collection of computer games (on cassettes, which are larger than you remember them being). At the back, underneath more comicbooks and even - what an amusing coincidence - a battered copy of The Lion, The Witch and the Wardrobe, there’s another box. Almost unnoticeable, because it’s a mottled dark grey. The small bulb is back near the door, and its light doesn’t carry far, even when it decides to work. Technically, it’s a box file, of the sort you’d perhaps see in an office. It looks almost new, which is incongruous given that the brand probably hasn’t existed for the last 20 years. I don’t remember where I got it; I just remember having it. Perhaps it even came from this very cupboard. Maybe it was always here. I knew what was inside, because the box was the reason I went into the cupboard in the first place. I had a small flashlight with me, in case the bulb didn’t work, but the bulb answered to the switch just fine. I hadn’t forgotten that cupboards are scary places. I took the box, and I made my way out of the cupboard. It always seems to take longer on the way back. The cupboard seems just a little bit bigger when you’re inside it. I didn’t hurry; that wouldn’t do. If you hurry, there’s always the possibility that the light might go out. Maybe plastic pine-needles would rake across your face in the darkness, and you’d bump into a stack of suitcases. Perhaps one would fall, and spring open. No, that wouldn’t do at all. The box is now safely (what an odd choice of words) back in Edinburgh, fifty miles away from that cupboard that is once again closed. Maybe I’ll never again open its door and hopefully flip the light switch. Or maybe it’ll just be another twenty years. It’ll smell the same. I wonder if any time at all actually passes in there. When you’re in a dark cupboard, some of the normal rules of real life don’t seem to entirely apply. The box is very real, though - an unremarkable thing, sitting here on my desk beside iPads and iPhones and all these other objects that did not yet exist when it was put into the cupboard. It contains my stories. Starting when I was about eleven years old, I wrote stories. Most kids do, don’t they? For me, the genre was ‘horror’ fiction, and I use inverted commas because “horror” is such a crass word. The real genre, of course, is something like “weird, uncanny tales - sometimes involving the supernatural”. You’ve probably written a few stories like that yourself. I wrote on an Amstrad Notepad NC100, and printed my stuff out on some hideous old grey-beige monstrosity of an inkjet. The cheap paper smelled vaguely of wallpaper paste, and the printer sometimes smelled like it was burning. That seemed entirely appropriate. It lasted about five years before it decided to spectacularly end its own life one day, complete with banded bloodstains in blue-green, yellow, pink and faded black. It was a gruesome scene, and I adored it. As the nights draw in toward the end of the year, I feel like writing again. Not the sort of writing I usually do here on the blog, or in tech magazines and such. Stories, just like these old ones in the box from the back of the cupboard. I have to go soon; it’s after 5 PM on the last day of the year, and we have plans for tonight. But I can spare a few more minutes, I suppose. I think I want to write more stories in the new year that’s now only hours away. Some longer, and some shorter. And I think I’d like to share them with you. Maybe I’ll even see if I can scan these old ones in, and tidy them up. Resurrect them, you might say. That would really be reopening the box. I had a quick read of one, and it seemed to hold up. A couple of parts made me cringe, but cringing can be a good thing. It’s not pleasant, but it’s instructive. Cringing, and other unpleasant feelings, can be a survival mechanism. I have to go and get ready. Tidy myself up, maybe put on a suit, and see the new year in with style. 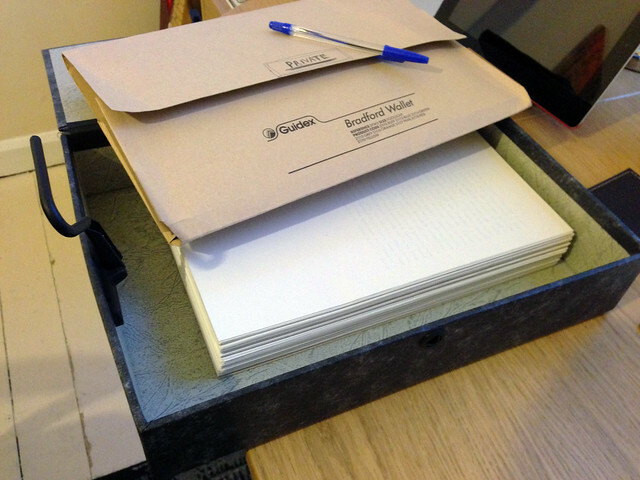 My stories waited in the box for twenty years, so I think they can probably wait another few days, here in my office. Stories can wait forever, if they need to. Eventually, the cupboard door always opens. Sometimes, the light even comes on.